When you first start as an Uber driver there are a lot of mistakes people will make. You don’t know how to do something correctly until you have had hands on experience in the subject. I was having a conversation earlier today with my mom about this. I was telling her how I was gonna make my millions and my goal is to make 100k this year between Ubering and my websites. I mean, that is kind of my career path. I’m an entrepreneur. I’m trying to start my own business. Don’t get me wrong, education is very important. But, it is not always the path you need to take. Bill gates and Paul Allen are both college dropouts and are also two of the wealthiest people in the world. Michael Dell is in the same category of the first two I named. I told my mom that if I’m making that kind of money I don’t need to go back to school. I can learn from mistakes with hands on experience instead of spending four years in school only to make those same mistakes anyways. I value hands on experience over education because you are still educated a long the way. Since I have already been driving for Uber there is a lot of hands on experience I have to share. I don’t want you to make the same mistakes as I have done. 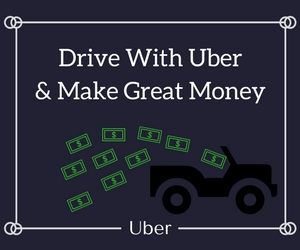 This is why in this post I will be sharing 18 essential Uber driving tips that every driver should know so you don’t repeat my history and can make more money with more satisfied riders. Read on to hear my tips. There’s plenty of times where I drove someone to the next city over and then on my way back to my starting point I would receive a request for a ride literally block over from where I dropped off the last passenger. I’ve done this numerous times only to learn that each time I ended up burning more gas and adding more wear and tear to my vehicle than what was actually needed. With driving for a living, saving pennies on gas will add up to hundreds or even thousands of dollars saved. So, stay put. Try not to hover back to your starting point. Note: If you been sitting in one spot for 15-20 minutes and still no requests, then ya maybe you should move. Just don’t drive back right away when you could end up getting a requests the next block over. I think greed plays a factor with surge pricing. As drivers, we’re all hustling to get that next fare to make more money. When surge pricing jumps into the picture, now we’re all hit with the taste of extra money for the same amount of work. Problem is, the surge pricing will be on the other side of the city and we have to drive 15 minutes to catch it. It’s like a tease where you are trying to get home because your favorite meal is being made, but by the time you get there it’s all gone. Don’t chase surges. Wait it out. If you are working enough hours eventually the surge will pop up in the area you are driving. If You Decide To Chase Surges…. If you must…Maybe it’s surging extremely high in an area and you feel you must go. My advice would be to go offline until you get to the area. 1.) If you’re chasing a surge you don’t want to get a request from another rider before you to get the area or it may be too late after you do the pick up and drop off. 2.) Surge pricing is based off an algorithm that Uber created. If you show up in the surge area that means there’s one more driver on the road. Now you have added extra supply meaning there’s less of a demand. The second part is how many riders have the Uber app on. This shows Uber how great the demand is. You don’t want to add extra supply before you make it to a good area or you could potentially lose out on the surge. This is probably one the most used tips I have for you. I’m constantly looking at the passenger app so that way I can see how many drivers are online and where they are located. When requests for rides are made they are pinged to the closest driver to the rider. This is how Uber is able to provide rides within minutes. So, if there are 3-4 drivers next to each other side by side. The middle guy will be the last one to get a request if there’s enough to go around because he’s in the middle of the pack. There’s a driver on each side of him that would end up being the closest driver. Where I live I constantly see all the drivers crowd in downtown. I will stay a few blocks outside of downtown so I get all the requests outside of downtown while the others hardly get any because they are all next to each other. Using Uber’s passenger app is a great way to strategically place yourself where you can cover the largest area to attract the most requests. I have never actually done this, but I read about it from another Uber driver. They basically went on to say they got a request from the same person 3 times and after declining each time Uber kicked them off the app. From my understanding they were able to go back online after, but it just shows Uber’s paying attention to you and you don’t want to jeopardize your chances of getting deactivated my ignoring requests. Besides, if you’re online I don’t see a point in you not wanting to get rides. So I’m sure this tip is only useful for a handful of people. But do be cautious. No, I am not saying you have to have them for the rider. I get it. That stuff cost money and most riders that don’t tip don’t deserve extra amenities. But, you need to think about yourself for a second. You’re trying to make money so you don’t want to go offline and make a whole bunch of pit stops. It will slow down your income with all that wasted time. Brings snacks and water so you can keep yourself fueled while you are working. Some people do tip. But, most of the time when they tip they only seem to have a $20 bill and obviously don’t want to give you the whole bill for a $10 ride (Although it has happened). Carrying change will help increase your chances of getting a tip for those that actually want to give. I’ve missed tips by not carrying change and have gained tips by carrying change. Don’t lose out on tips because you didn’t bring change for their 20’s. Uber doesn’t pay you for your mileage. So what. That doesn’t mean you have to lose money on it. Considering it is 2016 now, and tax season is right around the corner. You want to get every penny you can. So, the less stuff you’re taxed on the better. I spend about 25 cents per mile for gas and maintenance. When you do your taxes you get about 55 cents tax deduction for every mile you drive. Keeping track of your miles will go a long way considering you’re driving a couple hundred miles a week if you do this full time. Forget To do this enough times and you will be regretting it. Trust me. I drove a guy an hour once only to find out he left his wallet in my car after by mistake. I did not realize this until I was already home. I ended up driving an hour to his house to return the wallet and of course not get paid for it. By me simply not checking the backseat I wasted 2 hours of my time returning his property without receiving anything in return. Don’t make the same mistakes that I have already done. Check the seat after each ride and you will never have to waste all that time returning things. Admittingly, I didn’t drive around with one the first few months of driving because the people that inspected my car forgot to give me one. Luckily, I never got pulled over and ticketed for not having one, but if I was to it would’ve cost me almost $1,000 for something that seemed so minor to me. Just because I was lucky doesn’t mean your luck will be the same. It is better to just have everything in order than to take your chances like I did. Plus, with the sticker it makes it a lot easier for the passengers to recognize your vehicle and you don’t have to deal with riders questioning why you don’t have one on. I’m sure you here it all the time. I’ll even tell you how I make good money. But, this doesn’t mean you will make great money too. You could be in a small town that not many people use Uber. Or even knows it exists yet. Uber started in San Francisco and even still I pick up people in the area that will tell me they just discovered Uber last week and I’m their first ride. If this happens near San Francisco then it’s more probable to happen in other areas too. Start off driving on the weekend and see how you like Uber. After a little while, if you feel it’s worth it, then quit your other job. But, like I said, don’t just quit your job before you have even experienced your first ride. This is very important and something that I made a mistake on as well. I was driving to the location where the ride was requested and as I pulled up a group of people waved me down. They jumped in the car and I was on my way. Come to find out after I had already started driving these people were the wrong group. They knew it before they got in, but didn’t want to keep waiting in the cold for their actual Uber ride. So, after the ride I told Uber to give the person a refund because I didn’t actually pick them up. This means I made no money because Uber had to give a refund because of my mistake. On top of that, I’m sure the person I was suppose to pick up gave me a bad rating because that’s what I would’ve done if it happened to me. Luckily, the group I picked was kind enough to give me $20 in cash for probably a $7 ride. But, had they decided to be rude, I would’ve given a free ride to a group of people without any compensation for it. One of the easiest tips I can give you without a doubt. When it comes to taxis, this is the thing that passengers comment the most on. About how taxi drivers don’t maintain their car very well and there’s always some funky smell in the taxi cab. Passengers hate it and is one of the ways a lot of people end up leaning towards Uber for a ride besides the lower prices. I pick up people all the time and the first thing they will say to me is how great my car smells. When someone says that it means I’m giving a great first impression. This usually makes the rider experience more pleasant and gives me a better chance of having a 5 star rating and receiving a potential tip. Music is life. This world wouldn’t be the same without music, and without sound. Every single person loves music in this world. Whether it’s the same kind of music as you is a different story. Think about a movie. Most of the time there is some kind of sound in the background. If there wasn’t the movie wouldn’t be half as good. Same thing with an Uber ride. I like to put my music on low and play music that was a hit for everyone. The ones that don’t like my music are usually still fine because at least they’re listening to something instead of having that awkward silence in the car. While I have other people that will tell me to turn up the sound because they love the song. It makes for a great ride when we are all singing in the car. I usually encourage people to sing if I hear them mumbling the song. Lots of times they laugh and will call themselves a terrible singer. It’s a great ice breaker for having a more pleasant ride. Nobody wants to be picked up by some person that has torn up ragged clothing and the scent of a dumpster. It makes for a bad experience and you could be losing out on future rides because people stopped using the app because of your appearance. You don’t have to look perfect. Honestly I just put on normal clothing that will spark conversations because it usually is sports clothing. Nobody seems to like a patriots fan now a days unless you are one yourself. But, at least be a little clean shaven and take a shower and all that other good stuff. I don’t think I have to talk to you about hygiene. But, simply have a clean appearance. People are looking for a ride, not to get on a roller coaster. So, speeding over the speed bumps, whipping around corners, and trying to jump over potholes like Frogger is just gonna make your passenger hate you. Drive slowly. be aware of all the street signs and drive legally. Simple as that. Act like you’re driving a limo. Not someone trying to spill your hot coffee. One of the biggest complaints people have for Uber drivers is the navigation. First off, if you miss too many turns you are now costing the passenger more money than what’s necessary. And they know this. Time is money. Use Google maps or whatever GPS device you have and take the correct route. In the beginning, drive a whole bunch of hours so you can learn the city and all of it’s backstreets and shortcuts. If riders don’t have to be your GPS they will be much happier, though I’ll admit there are a lot of backseat drivers anyways. I know, sounds simple huh? Truth be told, it is simple. Just stop dilly dallying after you accept the ride and head straight over to the pick up spot instead of talking to your friends for a few extra minutes. 1.) The quicker you are, the faster you get that second fare. 2.) The quicker you are, the happier the rider. Do I really need too say much more? If you have made it to the end. I know there were quite a few tips and probably even more that I missed. I wanted to try to be as thorough as possible so you can have a great experience as an Uber driver. If you have any more Uber driving tips let me know. Thanks for all of the information you provided here. There is a lot to think about when becoming an Uber Driver and I’m sure many think it’s very easy to make extra money and not even think of most of these tips in the beginning. You mentioned about not needing to go back to school, but don’t knock it. Even courses on economics and financing can help entrepreneurs. Thanks so much for this very informative in-depth article. I was thinking about becoming an Uber driver and, after reading this, I think I will give it a try. I do have a few questions, if you don’t mind. Are you ever afraid of being assaulted? What if someone throws up in your car or damages it? Does the clean up or repair come out of out pocket? As far as afraid of being assaulted, no I haven’t been afraid. But this doesn’t mean there aren’t instances of violence between a driver and passenger. I would recommend carrying pepper spray, and if you ever feel unsafe you can grab your keys, get out of the car, and then ask the passengers to get out too. They refuse you call 911. Never put yourself in an unconformable situation if it’s possible to avoid. As far as Vomit and damage, If someone gets sick in your car you should take pictures and report it too Uber to collect a cleaning fee. If someone causes extensive damage then I would file a police report. I believe there is a limit to how much Uber charges for damage. But with a police report you could probably get the rest in small claims court. I have never had any damage to my vehicle, however. Thanks for sharing. Is there any way people cant pay you? Also, do you worry about getting carjacked? Are you ever concerned about your safety? I am new to this state I am in and don’t know where the bad neighborhoods are all at so I would have to do some research. Do you have a boss or you are your own boss? People pay through the Uber app with their credit cards, so you don’t have to worry about not being paid. I’ve never been worried about being carjacked, though there will always be a possibility. If you are uncomfortable don’t take the ride. I also recommend carrying pepper spray. Definitely figure out where you don’t want to drive with research if you are nervous. And in the term of “Are you your own boss?”, you basically are. You don’t control the prices, but you do control your hours and where you work. I don’t talk to anyone from Uber unless I have an issue that needs to be rectified. That was a nice article that you wrote in giving tips to people interested in employment with Uber as a driver. Participating in this venture yourself, obviously you have knowledge about what to do, and not do in order to not only stay employed with the company but also to avoid making costly mistakes that could make it less profitable if one does not know what he/she is doing. Just asking, do you ever become leery picking up a stranger and chauffering him/her to a destination? Judging by your bio pic you look like you could take care of yourself, nevertheless one can never know about a person nowadays. Btw, I loved the one tip that you gave in which you stated after bringing a fare to his/her final destination to always check the interior of your vehicle. Some person could leave something inside the car, (illegal if you catch my drift) even by accident and if you were to be later pulled over by the cops . . .
Also please listen to your mom. Yes, she’s right you do need education no matter how successful one could become. You could make a lot of money in the business, however if you don’t know how to correctly invest it wisely, you still could go broke. Many a professional athlete has earned millions of dollars in a career. But because they spend, spend spend and have no idea about investments or just putting into the bank it is as proven fact that unbelievably after their careers end many of these athletes by the time they’re 45 years old are flat broke. I’m not saying that will happen to you and I wish you all the best with your plans. Still your mom has a point. Educating the mind is always something that ANY person should do no matter what his/her stated goal is for the future. Thanks for the comment. As far as being leery about driving strangers around, I’m quite comfortable with it. I love meeting new people and I’m one of the most optimistic people you will meet. I don’t let the negative affect me and most people that get in my car are interesting people to talk too. As far as the education point…I understand what you are saying and agree education is good for you. No argument there. I even like the point you made with athletes that make millions only to be broke by the end of their career. But, my point being is the fact you go to school for 4 years become $50,000 in debt by the end and then struggle looking for a job after. In my opinion this makes you broke before your life has ever started. Do I want to go back to school? Ya, of course. There’s still much for me to learn. But, going to school for something I’m never gonna use doesn’t make sense. Even in high school it wasn’t the teacheers that taught me much. It was myself that taught me. I was the smartest kid in my Algebra class and how I learned was looking at the problem and then the answer at the back of the text book. Then I figured out how the two connected. But anyways…School is great, it’s just not for everyone and I don’t completely see a point in going to school if I’ve already been teaching myself all along. Uber allows me to pursue my dreams because of the flexibility. Once I make it to a comfortable part of my life, then I may decide to go back to school. I’m a retired RN and am thinking seriously of driving for Uber. I am encouraged by your helpful tips. As far as education I agree with your Mom but I also agree with you. I was a high school drop out MANY years ago. I had 3 kids and raised them while working different jobs over the years. I gained a lot of life and work experiences. Then with 1 son still in high school, and I was 40 yrs old, I got the opportunity to go to college and nursing school. I truly loved my career as an RN. It was the right time for me to get my education. So you keep doing what you are doing. When or if the time is right get your education, you will never regret it. I appreciate your support. Do what you love. Being a nurse helps a lot of people and I’m sure is feels very satisfying when you get the satisfaction of making somebody’s life better in some way. At some point I’m sure I will go back for my education. Any questions about Uber let me know. Being an Uber driver sounds very exciting. It also sounds like it can be scary depending on who you pick up. These tips would be useful for someone who is looking to get into being an Uber driver. I think if someone shady got in my car that I would not feel comfortable with that. I may ask them to leave or just not even pick them up in the first place. There are a lot of crazy people out there and there is no way that I want to risk my life to give some stranger a ride somewhere. I get what you’re saying about safety concerns. There are some crazy people out there but that advantage is Uber has the passengers information. So, if something were to happen it shouldn’t be hard to find the person and punish them for their crime. Obviously you would never want to be in that kind of situation when you are driving for Uber which is why I recommend carrying some kind of protection. You could carry a knife or maybe pepper spray that attaches to your car keys. The thing about most people commtting a crime is they don’t expect there to be much resistance. This is an advantage because it allows you to catch them off guard with your defense. I recently read that pepper gel is a better choice because it stays on who you spray and doesn’t affect you as much as pepper spray. And why have it on your key chain? You would have to pull the keys fron the ignition to use it. Just my thoughts. I did not know pepper gel works better, but def a good thought. As far as where you put the pepper spray or gel, that’s ultimately up to you. You do have a good point though.